if it's not alaska silk, it's not really a silk pie! Peterson New 2017 Catalog Aug.
*Ship Date Requested...Please type in "Date" to ship...Mon, Tues, Wed are 2nd day...Thurs. is Overnight Service "ONLY"..No Friday ship dates! You may request a "Future" date also and we will ship accordingly! This dessert is the "Queen Bee" of all Silk Pies. 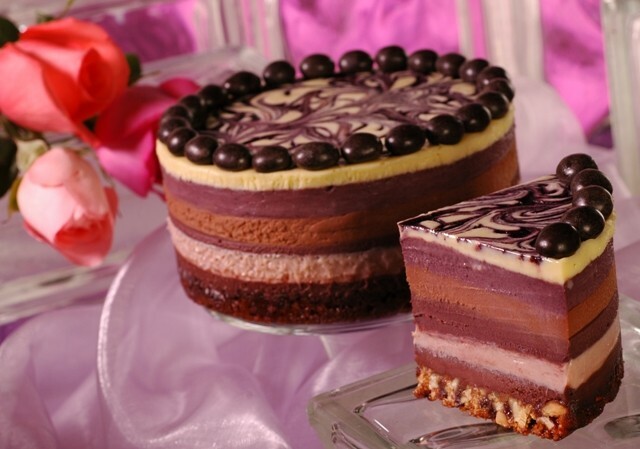 This 7 layered raspberry dessert is sure toDelight and AMAZEthe most discriminating of palates! How many of you have experienced the elusive "BLACK RASPBERRY"? Try this dessert and you'll be hooked on the first bite! The Royal Raspberry Silk was originally designed as a Private Signature Silk for Princess Tours. It has never been offered to the general public until now and Alaska Silk Pie Customers are the first to be able to experience this incredible decadent dessert! It is now an exclusive dessert for "YOU" our very SPECIAL VALUED CUSTOMERS. This is the Perfect RASPBERRY LOVERS dessert. An Almond and caramel first layer is topped with 6 more alternating dark and white chocolate raspberry silk layers. Layer 2: dark chocolate Black Raspberry Silk Layer 3: white chocolate Red Raspberry Silk. Layer 4: milk chocolate Black Raspberry Silk. Layer 5: dark chocolate Red Raspberry Silk. Layer 6: white chocolate Black Raspberry Silk. Layer 7: is our grand finale of white chocolate Grand Marnier Silk with Black Raspberry swirled throughout. I'm sure some of you are wondering what a "BLACK RASPBERRY" is and where it comes from....Well, the berry puree that Alaska Silk Pie Co. purchases comes from a farm in Cornelius, OR. It is Heike’s Farms and they produce the MOST BEAUTIFUL, PERFECT berries in the country and that is why we use Heike’s Farms for our specialty berries! The "Black Raspberry" is truly almost Black in color and extremely rich in flavor not to mention a very unique flavor all its own. You will be AMAZED with the incredible berry flavors of this delightful dessert!